This week has brought with it the first snow of the season, and a gradual shift in energy. You can feel the town, which is so dependent on tourism, start to slow down. Stores are closing for the year and people are leaving for their holiday vacations. It rains harder every day, leaving little windows of time for me to scurry to the grocery store or to go for a short walk up the fjord in the lighter rain. It is so odd to have nothing that I have to do all day- every day feels like a treasure; a rare day with no obligations, soon to be followed by another. I haven’t felt the itch to create yet, and I’m okay with that. I am still adjusting to this new, other-worldly place and trying to take things day by day, as the country and culture gradually revivals more of itself to me. I doubt I will create anything in two dimensions, instead, I am treating my time here as a time to research and create social exchanges that interest me. When you drive over the fjord, the valley opens up before you. The landscape is purple and umber, shaped by glaciers, streams and time. 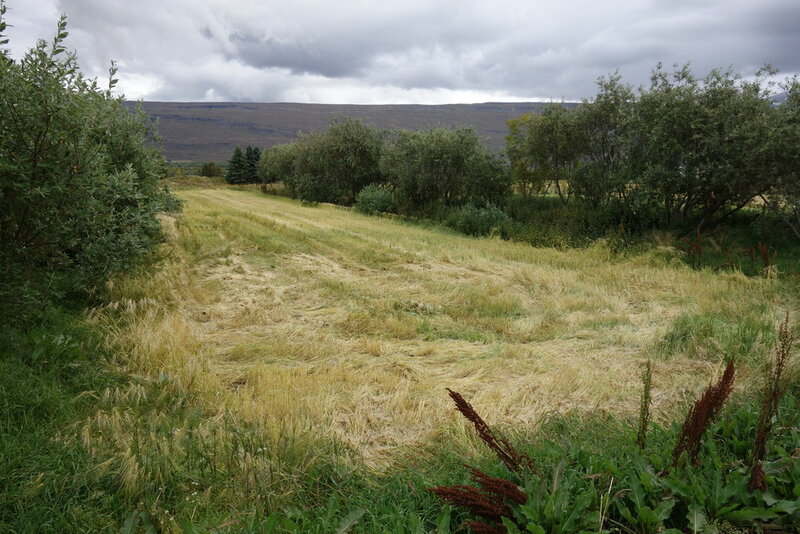 In stark contrast, Móðir Jörð is a patch of green. 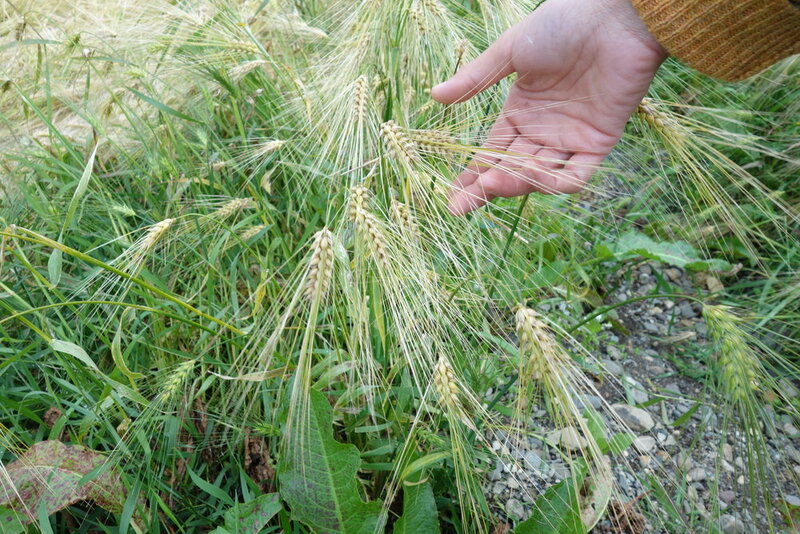 Walking onto the farm, there are small planted trees that separate rows of fields that grow flowers, wheat, barley and kale. 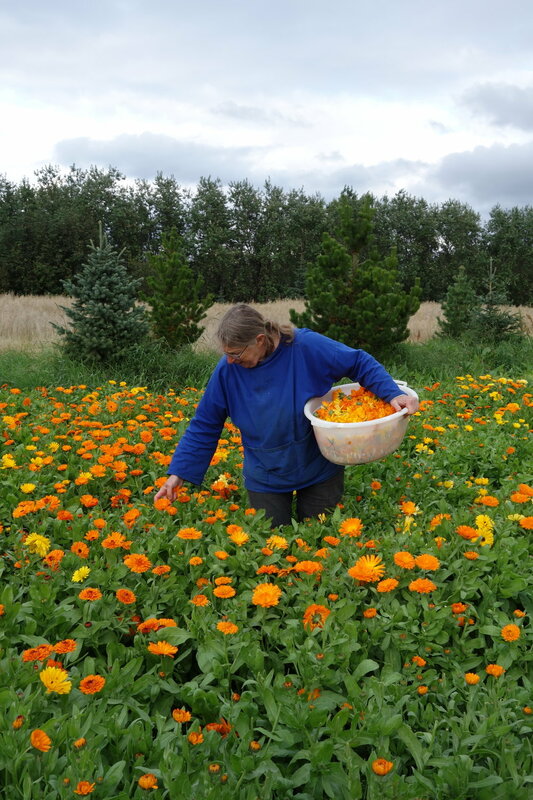 In Iceland, there are no pests and no need for pesticides. I visited with three girls from the residency. It was amazing to see how excited all three of them (three girls with opposite backgrounds from different sides of the globe) were to be on a farm. 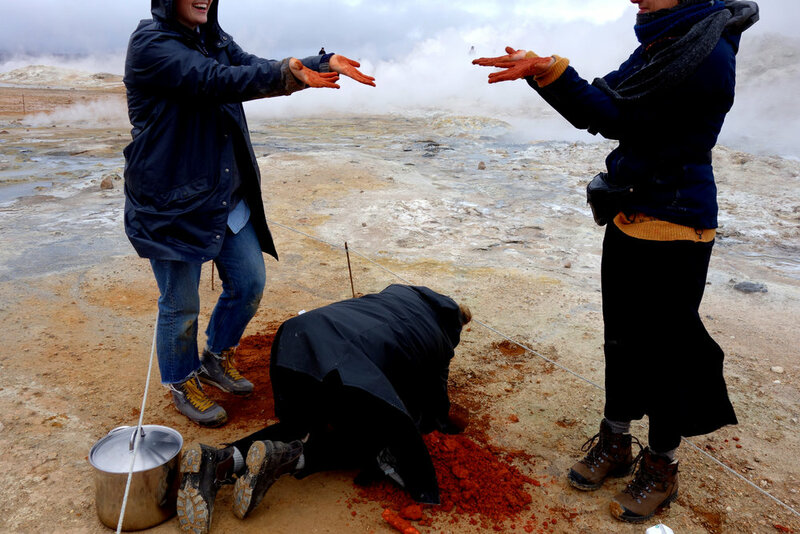 Iceland is so barren, it is refreshing and comforting to be in a place where plants grow. We stepped into the greenhouse and we’re overwhelmed with the warm perfume of basil, tomatoes, parsley, zucchini and butternut squash. It takes being so fully removed from fresh produce to feel the profound impact of healthy plants and moist soil. We dug into the earth, revealing layers of clay that gradually increased in density and moisture. The earth was warm; steam began to rise out of our dirt oven and we warmed our hands from the cold by reaching into the earth. We dug with our hands, holding the warm earth tight between our palms and creating balls of clay that mirrored the dense bread we would soon pull from the earth. Four hours and a meal of smoked fish later, we dug up our bread. 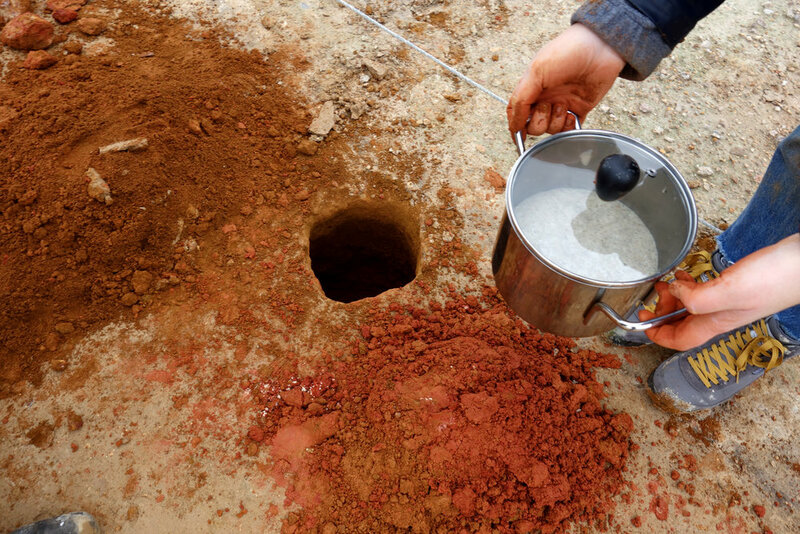 We wiped away the warm, red clay that stuck to the pot and opened the metal lid. Steam rose out, perspiration warming our cold faces. The bread from the earth was sweet, moist and thick. 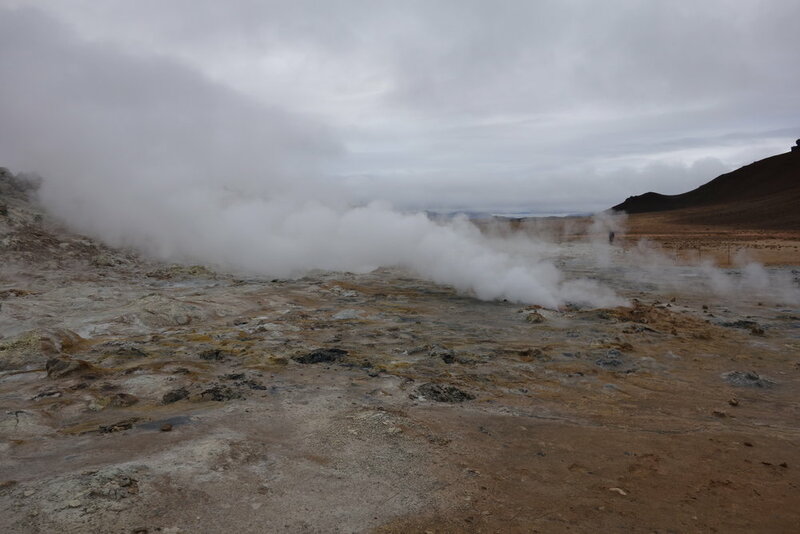 Hverir, a field at the base of steaming hills in the Mytvan region of West Iceland, is sprinkled with boiling mud pools (made from volcanic ash- blubbering and splashing metallic mud) and steam vents (that hiss as they steam, releasing more sulfur into the thick, smelly air). This was my second visit to Hverir, and I found it just as profound. I can’t help but think of the constant parallel of hot and cold that this country balances. The sulfuric white earth fades quickly to a deep, warm red clay just inches bellow the surface. Once a year, young and old men alike wake up early in the morning and drive up to the top of the Fjords. Together, they weave their way across the steep hillsides in waves, attempting to heard the wild sheep down to the shelter of a farm. The process is exhaustive and time consuming. I joined for the day as we chased sheep out of their home territory down to gated pastures, where they will be safe and warm all winter. 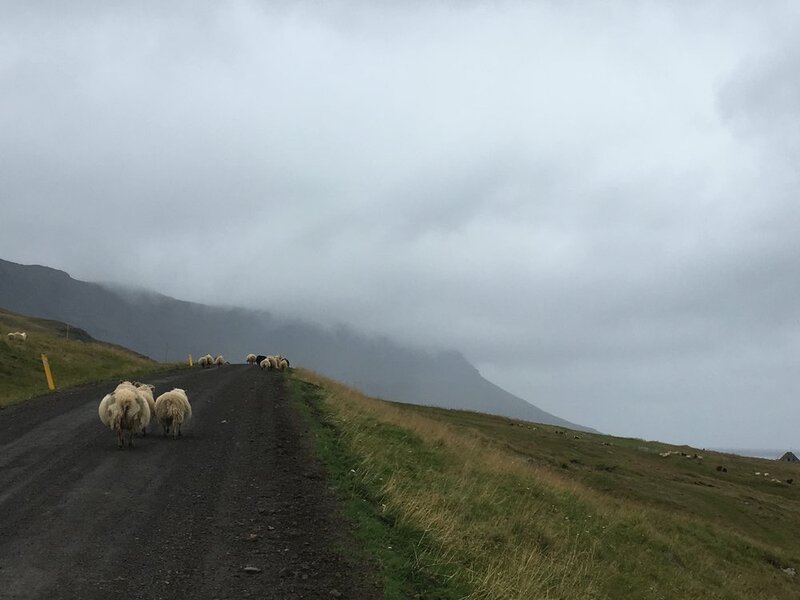 The sheep round up takes place all week, across Iceland. In a country with a more sheep then people, the round up can take days. 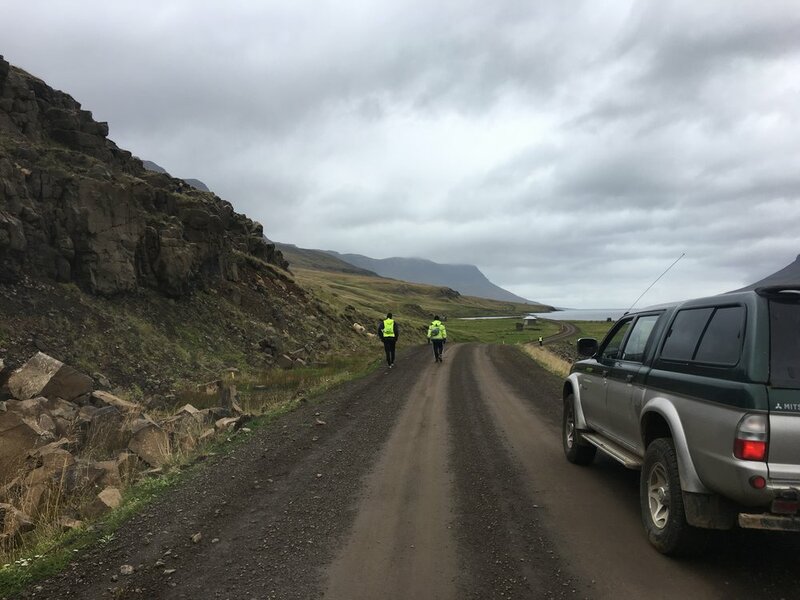 Teams of volunteers wear bright yellow vests and communicate with walky-talkies as they scan the fjords for sheep. With the sheeps herded to farms, the valleys are left to the Icelandic Ponies. I have spent the last week starting my own “garden” in the front yard of the residency. Iceland is the ideal climate for moss and algae- it grows everywhere: poking out of the cement sidewalk, growing on car windows, covering fields of lava, and growing up the sides of houses. What appears to be grass from a distance is actually soft, fluffy moss. Early this week I took a sample of algae from the glacial waterfalls that flow down the side of the fjord to meet the sea. By hanging them outside, I am able to utilize sunlight (that grows shorter every day) to grow bag after bag of algae. If you want to read more about it, click here. Every day here, I continue to be blown away by beauty that surrounds me. After cloudy mornings and all night rain storms, I walk along the water and look at this beautiful place, with colorful houses by the water, nestled in-between the fjords that glisten with waterfalls.